Stems mainly simple, often several together from a slender, perennial rootstock, 1 to 21/2 feet high, smooth or slightly pubescent. 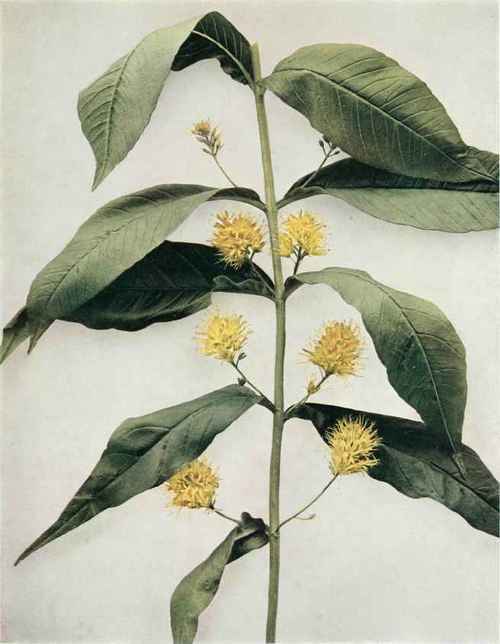 Leaves opposite, lanceolate or oblong-lanceolate, pointed at the apex, narrowed at the base, sessile, 2 to 5 inches long, one-third to 1 inch wide, the lower leaves reduced to ovate scales. Flowers yellow, spotted with black, one-sixth to one-fourth of an inch broad, in dense, spikelike, oblong or ovoid racemes on stout axillary stalks which are one-half to \\ inches long; sepals five to seven-divided and spotted, the segments narrow; corolla deeply five to seven-parted with rather narrow segments. Fruit a globose capsule which, when mature, is about as long as the sepals or slightly longer. In swamps, low woods and wet meadows, Nova Scotia to Alaska, south to Pennsylvania, Missouri, Montana and California. Flowering from the latter part of May to July. The same species is also found in Europe and Asia.